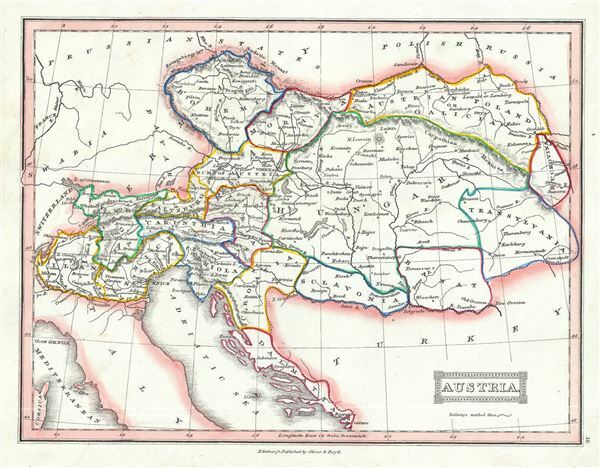 This is a lovely 1845 Thomas Ewing map of the Austria. The map covers the territories claimed by the once vast Austrian Empire, including in whole or part the modern day nations of Austria, Hungary, Germany, Italy, Albania, Croatia, Romania, and the Czech Republic. It also includes parts of Turkey, Switzerland, Germany, Russia, Prussia and Poland. Various important towns, cities, rivers, mountains and several other topographical details are noted with relief shown by hachure.